As light pollution causes the stars to vanish from night skies around the world, it’s no surprise that, increasingly, people are traveling to where the stars are still big and bright. Cities and towns throughout Texas are taking steps to curb light pollution, save money, and protect our priceless night skies by implementing night sky friendly ordinances and programs. One such program is the Night Sky Friendly Business Recognition Program. 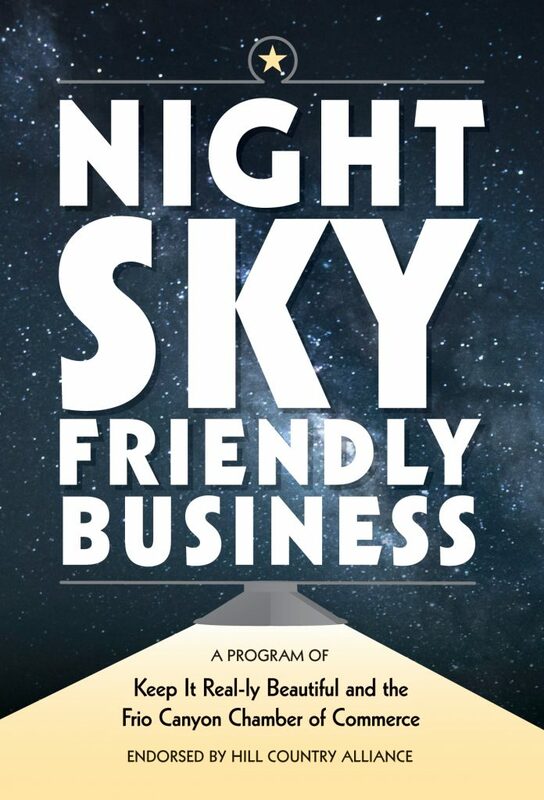 The Night Sky Friendly Business Recognition Program is a voluntary Chamber of Commerce sponsored program that gives public acknowledgement to Hill Country area businesses that have outdoor lighting that neither shines up into the nighttime skies to create light pollution nor causes excessive glare that prevents others from enjoying the starry nights. The program was initiated by the Blanco Chamber of Commerce and the Hill Country Alliance and can be adopted by Chambers of Commerce throughout the Hill Country. For more information on how to bring the program to your community contact HCA at info@hillcountryalliance.org. We thank all of our Night Sky Friendly Businesses! Dr. Kenneth L. Schramm, D.C., P.A.